Here, we present examples which are analyzed in our 2D online tool morphometer. 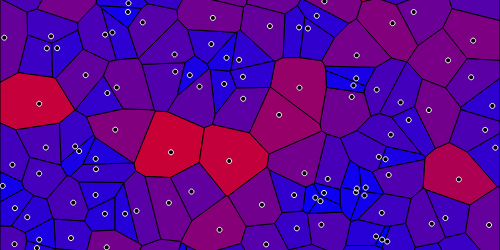 The structure Analysis of Point patterns and Disk packings is performed by analyzing the Voronoi or Delaunay tessellation of the configuration. To view an example, click on an image below. Analyzing point processes with different structure indices. A description of all implemented point processes can be found here. 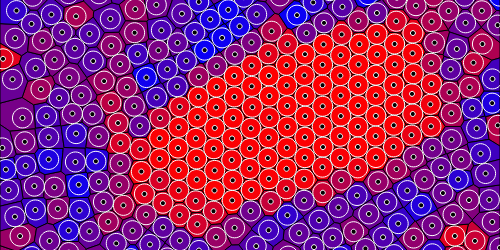 Hexagonal order in disk packings can be detected with the irreducible Minkowski index of the Voronoi tessellation of the packing. 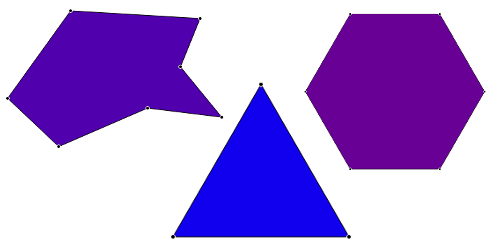 In the single polygon mode, different shapes can be analyzed with various shape descriptors based on Minkowski tensors. Analysis of gray-scale images by isocontours constructed with the interpolated marching squares algorithm. More examples and details where Minkowski tensors are used in the literature are presented in the References section.